A few weeks back I had the good luck to be included in a group blogger visit to Little Prince of Oregon Nursery. You might recognize their name because you've seen Stepables (walkable groundcovers) or their huge line of sedums and sempervivums. Or maybe you've noticed the hundreds of other plants they grow, because you're not living in a cave like I am. I had no idea that Little Prince sold such a wide variety of plants. Agaves! Natives! Ground covers! Ferns! Edibles! Grasses! I went with a short list of plants to buy but ended up with the largest haul of anyone because I kept finding more plants I needed. What did I get? The biggest Tillandsia xerographica known to man. I was blown away by their tillandsia collection. It was hard to choose just one. This guy is hanging in an impromptu swing in the bathroom. This is bigger than my head, if the photo belies the size. Epimedium 'Black Sea'. I have had a really hard time finding this epimedium. I bought three pots from Dancing Oaks a few summers back but they have been slow to bulk up. I freaked out a little when I saw that Little Prince offers them, and I snatched up five more. The leaves turn deep purple in the fall and winter, giving them their name. Little Prince has a pretty great variety of epimediums in their Fit for a King line. Mahonia nervosa. I bought a clump of this NW native a few years back and plopped it in the front rain garden. It gets full scorching sun and no water and it's been flawless. It's just as happy in shade. I bought a flat and a half to fill the side entry to the back garden, where the hose won't reach and it alternates between searing sun and full shade. This plant is bullet-proof and I couldn't love it more. Autumn fern (Dryopteris erythrosora). This evergreen fern was my favorite plant this winter, where it looked absolutely perfect, no matter the weather. It erupts into bronzy hues in the fall and continues all winter. Stipa tenuissima. My driveway strip is a little onesie-twosie and I've been wanting a mass-planted grass to unify the whole space. I thought, "What's the weediest, messiest grass I could choose?" and went with this one. I have three of them already and the seedlings pop up in the funniest places. The heart wants what it wants, I don't know. Woodwardia unigemmata or Chain Fern. Polypodium pseudo-aureum 'Virginia Blue'. If I had more than three square feet of moist shade, I would've bought more of this one. Those wavy blue leaves make me weak in the knees. Jovibarba hirta 'Bulgaria'. I couldn't leave Little Prince without some hen-and-chicks, and I'd never heard of this one. Agave franzosinii. If I wasn't already planning to marry Greg (in June!) I would marry this beauty. Loree got some great shots of large specimens at the Ruth Bancroft Garden. This is my favorite agave right now. It's hardy to 15-20 degrees, which means we'll definitely get a super cold winter next year. Because life is cruel and sometimes it wants you to buy replacement plants. Agave gentryi 'Jaws'. I've wanted this one forever, thanks to Gerhard and Loree. I finally have one! Agave parryi ssp. huachucensis. I had one of these (it was my favorite agave) and last winter turned it to mush. Again, because I planted this, next winter will be miserable. I'm so sorry! Agave utahenesis ssp utahensis. Look at those gorgeous chompers. I am still kicking myself for not getting more plants. Why didn't I pick up a Silver Surfer agave when I've wanted one forever?!? What is wrong with me? I've got almost all of my plants in the ground now and I've been thrilled with how healthy and well-rooted they've all been. Keep your eyes peeled for LPoO when you visit your local nursery, and if you see something on their website that your nursery doesn't carry, let them know you want it. And a huge thank you to Mark and the Little Prince of Oregon crew, who so generously opened their greenhouses to us. Nice post Miss Heather! Why didn't you buy more? Hmmm…me thinks another visit is in order. I'll be keeping my fingers crossed that your Agaves all survive. You bought some of my favorite plants too. Methinks that too. I was out of money! 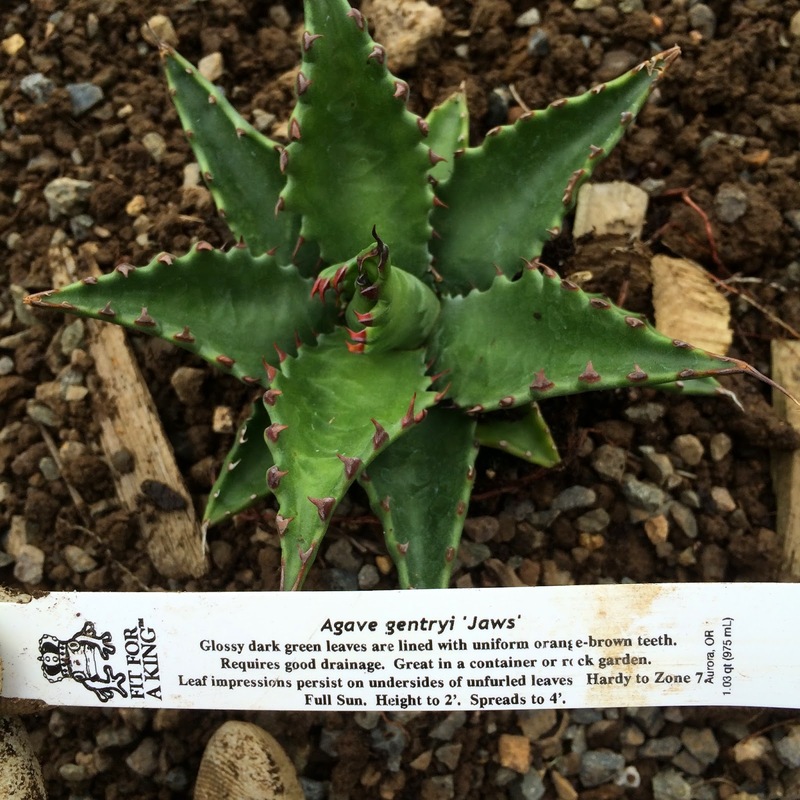 Oh boy, only if it's Agave attenuata! We're so impressed with the selection of plants they have, and how pristine their site is! It looked like such a fun day too! I'm still pinching myself that we got to go! You got a great haul! So glad y'all had a great time at LPO! You'll have to join us next time! Looks like you kept your wits about you and loaded up on some pretty special plants. I think we all came home with reverse buyers' remorse, dreaming of the plants we left behind. Totally. I was out of cash, so I couldn't buy more, and yet I'm still berating myself!